You might even think you’ve been thorough by realizing that web hosting providers give deeper discounts for longer time periods. Perhaps you’ve compared the cheapest yearly hosting plans instead of blindly following what providers display on their home pages. Chances are, you just got conned and I’ll show you how hosting providers trick you into paying too much, while still allowing you to think you got a great deal. (1) is where you get the greatest value. After that, the honeymoon ends and you start paying the full renewal price after the first billing cycle. The ideal is to maximize (1) before starting (2). From the hosting provider’s point of view, they want to start you on (2) as soon as possible. They might even lose money on the first period! That’s because they know that people are reluctant to change their hosting service once they’ve settled in. What better way to make you forego the huge discounts in period (1), than by enticing you to make it as short as possible? Hostgator is the worst offender here. They have a special “PENNY” plan which allows you to host your website for, wait for it…1 cent! That’s right. You can avail of their shared hosting plan almost for free. But there’s a catch, right? Yes, there’s always a catch. The problem is that this 1c deal lasts only for a month. “Well, no big deal”, you tell yourself. After all, I’d be paying for the second month anyway, even without the PENNY deal. And this is where you get caught. 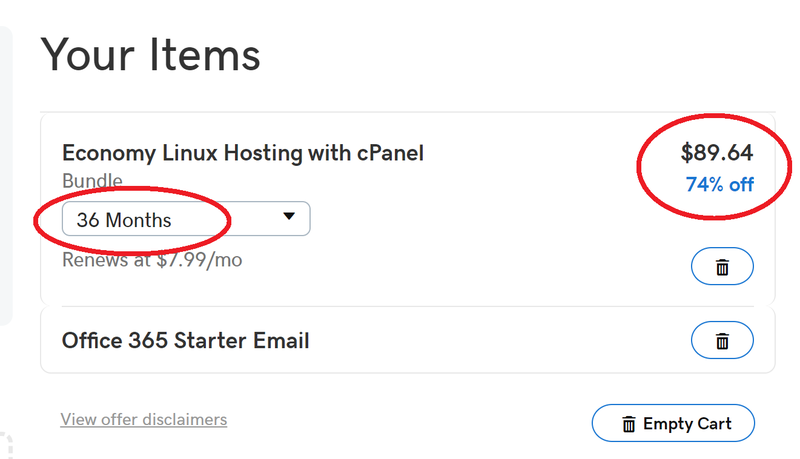 After that first month, you will be paying the full price of their hosting plan, which is currently $8.95. You have effectively foregone the entire first period of discounts for the lure of 1c! A side problem is that Hostgator can secretly enroll you for a higher tier hosting plan without telling you. Since the price is 1c for the first month of both Hatchling and Baby, you might not notice that you’ve been bumped up! But this is so obvious, that a lot of people don’t fall for it. A more insidious example is GoDaddy’s famous $1 web hosting. Like Hostgator, this too gives you a ridiculous discount of just $1/month. But this time, you can sign up for 12-months, or 1-year. $12 for a year of hosting. Ridiculous! But cheap? Not so much. Remember that GoDaddy will start billing you the full price of the hosting plan after a year is up. As opposed to their regular shared hosting (discount promo codes in link), which you can pay for up to 10 years in advance! So the only situation in which $1 web hosting is a good idea, is if you plan to host for exactly one year and then switch hosting providers. Over 3 years, it’s one of the most expensive! It’s cheaper to purchase GoDaddy for 3 years, than it is for two years! That’s ridiculous! The additional discount for three years is enough to overcome the cost for an extra 12 months! After seeing this chart, you’re probably thinking “Well, GoDaddy is obviously the cheapest web hosting you can purchase”. Hosting providers have found their new cash cow. A few years ago, this wouldn’t have mattered that much. Most websites were perfectly fine with good old HTTP. Until Google and other companies started pushing for secure SSL connections on every single site. Now everyone’s forced to implement SSL on their servers just to stay safe. Now some of you know my thoughts on this. In today’s world, I don’t believe anyone should pay for SSL anymore. Free initiatives like Let’s Encrypt make it easy for any business to get basic SSL security. Not the high end, private or EV SSLs, but enough to not incur a penalty from Google in the rankings, or in the Chrome browser. But most website owners don’t know about Let’s Encrypt and other ways to get free SSL like Cloudflare’s “Flexible SSL” option (see link in the previous paragraph). And hosting providers exploit this ignorance to sell expensive SSLs that often cost as much as the hosting itself! And this is the new differentiator when it comes to Total Cost of Ownership (TCO) of a website. Here’s the pricing chart for SSL costs from each provider. The ones with “Free”, are those who either support Let’s Encrypt, or those who provide their own separate free SSL like InMotion hosting. Note how expensive GoDaddy SSL is! Which flies in the face of GoDaddy being the most economical hosting service. Cheap hosting? Yes. Cheap SSL, hell no! Why Can’t I Purchase my SSLs from Elsewhere? You absolutely can! If you want to go the extra mile, you can purchase web hosting from provider A, get your SSL certificate from provider B, and then import the SSL into your web hosting. You can even generate free SSLs from Let’s Encrypt to use with your hosting. What’ the problem with that? I’m a big believer in the KISS principle – Keep it Simple Stupid! Yes, you can purchase an SSL and use it elsewhere, but it requires fiddly stuff like downloading and certificate files etc. The more complex a procedure is, the higher the chances of something going wrong. Point and click is honestly the best way to do these things. The free Let’s Encrypt certificates are only valid for 90 days each. If you generate and import them manually, you’ll have to remember to renew them every 3 months. Needless to say, this is a recipe for disaster. It’s very dangerous to have your SSL run out like, and I feel the risk isn’t worth it. The safest way to use Let’s Encrypt is when it’s offered directly by your hosting provider. They will renew it for you automatically 1 month before it runs out, and you’re never in danger of losing SSL protection. In short – don’t purchase SSL elsewhere. Keep it simple! 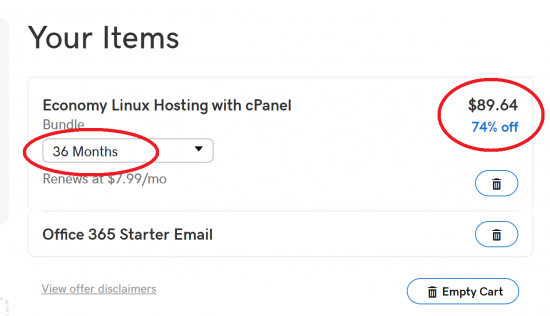 The $1 web hosting is a terrible Even for annual hosting! Knowing these two tricks in advance will help you avoid the traps that make you pay too much for web hosting. Remember – these days “web hosting” isn’t enough. You need SSL to have a functional site. And when you take that into consideration, everything changes! Hosting providers that were previously too expensive compared to the others suddenly become the most economical! Stay smart. And happy shopping!